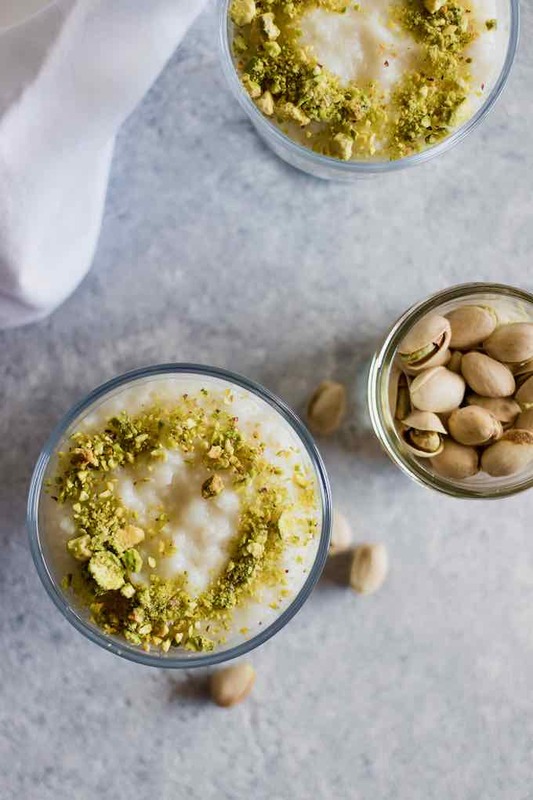 Mhalbiya (المحلبية) is a Tunisian rice pudding dessert dish made from white rice and flavored with geranium water and vanilla, and topped with crushed pistachios and dates. It’s a simple recipe that comes together in under twenty five minutes and is delicious enough that your family will be begging for seconds. Traditionally mhalbiya is made with geranium water, but Tunisians variations also use orange blossom or rosewater as well. 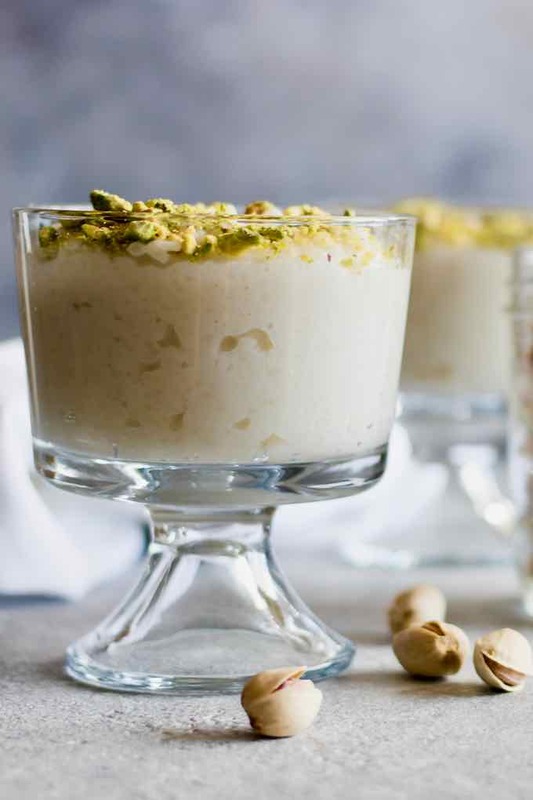 Most Tunisian mhalbiya rice pudding variations are topped with crushed or boiled nuts such as pistachios or almonds, and many also top the dish with dates, which are a common ingredient in Tunisian desserts. Rice pudding is a dessert that spans cultures and cuisines across the world. 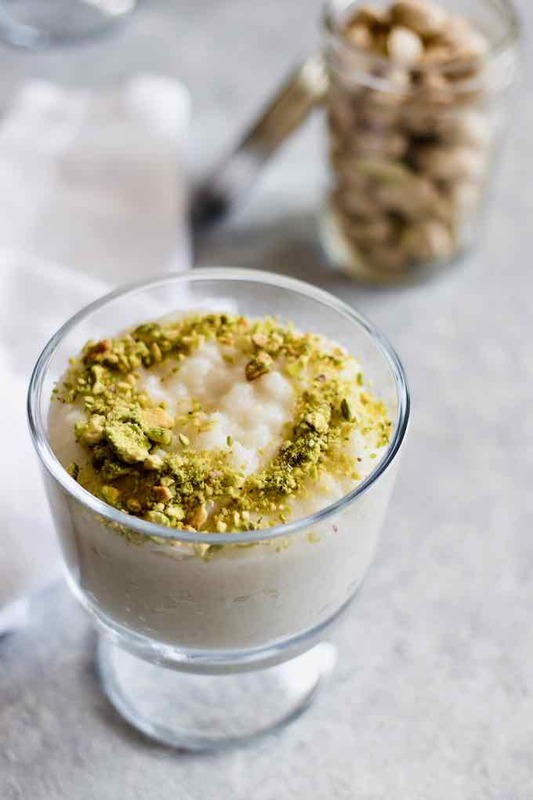 While Tunisians know sweet rice pudding as mhalbiya, it is called muhalibiyya in many Arabic-speaking countries. 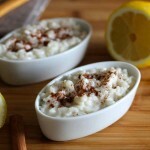 In Lebanon, rice pudding is called moghli and is often spiced with anise, caraway, and cinnamon. 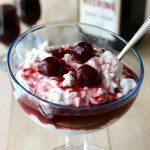 In Egypt, it is ruz bil-laban, in Iraq it is zarda wa haleeb, and in Israel it is dubbed pudding orez. 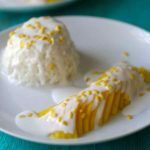 Countries throughout Asia also have rice pudding dessert dishes. 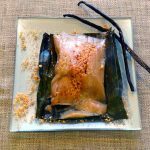 Khanom sod sai is Thailand’s version, bubur sumsum is from Indonesia, and tsamporado is a rice pudding dessert in the Philippines. 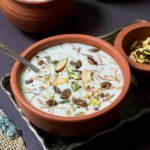 India has many different rice pudding desserts, including ketan hitam, made from a black glutinous rice porridge, and dudhapak, a basmati rice dessert sweetened with sugar and topped with nuts and saffron. And don’t forget kheer, India’s most popular rice pudding dish. But don’t think that Africa and Asia are the only continents that have rice puddings! German michreis is made with cinnamon and apples, Icelandic grjonagrautur is topped with raisins and Hungarian tejberizs and rizfelfujt are also traditional rice dishes. And who can forget arroz con leche, Spain’s favorite rice pudding dish, which has taken on a life of its own throughout Central and South America. Bottomline, the world loves its rice pudding. Tunisian mhalbiya is traditionally made with round or ground rice, which can easily be achieved by running long or medium grain rice in a small food processor until the kernels are small. The small rice kernels are then boiled in a mixture of geranium water, sugar, and vanilla until they are softened, and then hot milk is gradually stirred while cooked over low heat. 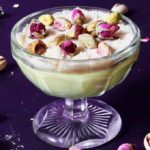 The rice will eventually thicken and become a pudding-like consistency, and mhalbiya is then scooped into serving dishes and topped with pistachios and dates. Mhalbiya is very similar in concept and presentation to krima tounsiya, with the exception that krima tounsiya uses cornstarch instead of ground rice, and also incorporates egg yolks. Mhalbiya is a common dessert that can be found on Tunisian tables at any time throughout the year, but is most often eaten for holidays or large celebrations like weddings and festivals. It can be served in individual portion sizes, but it is most traditionally made and served in a large bowl with toppings that are then served to each guest. Geranium water is a common flavoring found in many Tunisian dishes and can be easily ordered online if not found in grocery stores. Tunisians also commonly use rose water, jasmine water, and orange blossom water, but any floral water will do in this mhalbiya recipe. To serve mhalbiya in a complete Tunisian meal, you could make the egg and meat baked tajine maadnous as an entree or appetizer, followed with a farfoucha or chebtiya couscous dish, and serve this mhalbiya as dessert. And don’t forget the citronnade as a refreshing drink! Love this Tunisian mhalbiya recipe? Try another of our delicious recipes from Tunisia and make sure to tag us on social or leave a comment to let us know what you think of the recipe. Happy adventures in cooking! 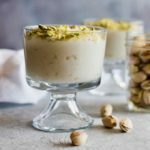 Mhalbiya is a deliciously creamy Tunisian rice pudding dessert prepared white rice and flavored with geranium water and vanilla, and topped with crushed pistachios and dates. In a large, non-stick saucepan, bring the water to a boil. Add the sugar, vanilla and geranium water and mix well. When the sugar has dissolved, add the rice and mix well. Cook covered over a very low heat for 20 minutes. Halfway through cooking, add the very hot milk in small amounts and stir constantly. If necessary, do not hesitate to add more very hot milk to obtain a thick white porridge. Remove the pan from the heat and transfer the mhalbiya to ramekins or glass cups. Decorate with dates and/or pistachios. Hi! I want to make this dessert, but I can’t find geranium water. You say that it is found easily online, but everything I find says for external use only. Do you have a vendor/brand you recommend? Hey Rebecca, we should have been a little more precise in the article. It appears that Geranium water is really made from Geranium attar of rose. Hence, what is sometimes called Geranium water in the Middle East and North Africa, is what we call rose water as the choices are limited outside of this region. There are obviously various types of rose waters that will have slightly different tastes, but you can and should use rose water (which is readily available in the Western world) to make this recipe.